The Cham issue is an issue which has been raised by Albania since the 1990s over the repatriation of the Cham Albanians, who were expelled from the Greek region of Epirus between 1944 and 1945, at the end of World War II, citing the collaboration of some of their number with the Nazis. While Albania presses for the issue to be re-opened, Greece considers the matter closed. However, it was agreed to create a bilateral commission, only about the property issue, as a technical problem. The commission was set up in 1999, but has not yet functioned. In 1913, the area of Chameria, as the whole Southern Epirus came under Greek control. Cham Albanians were given no minority status and they were discriminated. Muslim Chams were counted as a religious minority, and some of them were transferred to Turkey, during the 1923 population exchange, while their property was alienated by the Greek government, this being a term of the Turkish-Greek peace agreement. Orthodox Cham Albanians were counted as Greeks, and their language and Albanian heritage were under pressure of assimilation. At the end of World War II, nearly all Muslim Chams in Greece were expelled to Albania. They had collaborated with occupation forces and decided to join the Greek resistance only after the summer of 1944 when it was clear that the Germans were withdrawing. In January 1991, as the Communist Party of Albania was disintegrating, the Chameria National Political Association was founded as a political lobby to "express and defend" the interests of the people of Chameria. The main issue that Muslim Cham Albanians demand is the restoration of the Greek citizenship, whilst retaining the citizenship of the country in which they currently reside and the recognition of a minority status. The restoration of their properties is another main issue, while some would not accept only financial compensation. According to most Chams, money is not as important as citizenship. The same rights that the Greek minority in Albania enjoys. ​The controversial Cham issue has lain dormant in recent years and none of the post-war Albanian governments, whether communist, democratic or socialist, have ventured to try to make it a key issue in relations with Greece. Protests held by Cham organizations were ignored in Albania by both major parties, both the Democratic and the Socialist party. This is seen by some analysts as an attempt to strengthen the negotiating power of the Albanian government by non-raising the Cham Issue, while it could legitimately claim that it was obliged to raise the Cham question because of such strong pressure from the Cham community. The major Cham march of 2006, also strengthened the position of the Albanian government because it provided additional arguments in the controversy over the graves of Greek soldiers on Albanian territory. The Albanian government used as a justification the fact that Greece did not allow Chams to pay homage at the graves of their forefathers, while they were asking to build several cemeteries for its soldiers killed in Albania during the Second World War. But according to scholars, the Albanian government cannot ignore the problem due to growing pressure from Cham organizations and sympathizers within the main Albanian political parties. Although the Albanian government has avoided addressing the Cham issue, prominent Albanian individuals such as former President Rexhep Meidani and Sabri Godo have raised the subject publicly on a number of occasions. The Cham issue was risen during a visit to Athens of former Albanian Prime Minister Ilir Meta at the end of 1999, during his meeting with Greek Prime Minister, Kostas Simitis, but it received a negative response. when it could be established that Chams had not convicted or participated in crimes against their fellow Greeks and their fleeing from the country was only due to fear. This proposal, however, did not reach any results. When the former Albanian Prime-Minister, Ilir Meta rose this issue to his counterpart, Kostas Simitis, the later considered it as a declaration for home consumption to Albanian journalists covering his visit. Simitis confirmed that Albania expected the Greek government to solve the issue of Cham properties according to the European conventions by which Greece abides. The approval of the Cham resolution by the Albanian Parliament was seen by the Greek ambassador in Tirana as "a non-friendly act by Albania.” While the leader of the Greek Minority Party in Albania, Vangjel Duke declared that "this resolution comes at a time when the Balkan region is witnessing intensive events and a period of fragile balances, and the approval of such a resolution would damage those balances that could result in a high political cost for Albania’s foreign policy." The Cham Issue has not been in the agenda of international organizations. Delegates of the Cham community have started since 1991, an attempt to internationalize the Cham Issue, while the only official support for this issue, has come from Turkey.Meanwhile, in 2006, Members of the European Parliament backed the issue and proposed a resolution, which was not put into vote. The only major attempt to internationalize the Cham Issue was in 2005, when representatives from the Cham community in Albania met with members of the European parliament in Strasbourg. European MEP, Doris Pack, Chairperson of the European Parliamentary Delegation for South-Eastern Europe was presented with a dossier about the Cham issue and promised to investigate the possibility for the Chams to visit their homeland and their family graves in Greece, as well as the issue will be discussed with Albania and Greek European MEPs. Other Members of the European parliament promised to look at the possibility of proposing a Parliamentary Resolution which would seek to open a dialogue between Athens and Tirana, with the representation of Chams and international mediators. Turkey, meanwhile, is finding the Cham dispute a useful tool with which to draw international attention to the situation of the Turkish minority in Greece. Turkish Ministry of Foreign Affairs has accused Greece for genocide onto Muslim Albanians. Turkey asked Greece to acknowledge the Albanian nationality of Albanian-speaking Orthodox Christians in the same area, to compensate the displaced Chams for the property they have lost, to provide an Albanian Orthodox Church for Albanian Christians, to repatriate the Cham minority and to provide them with Greek citizenship. The main part of the Cham issue is the regaining of the Greek citizenship, by Cham Albanians. As Greece does not acknowledge the Cham issue, as an existent problem between Athens and Tirana, the returning of the citizenship has not been discussed at all. Cham Albanians were Greek citizens of Albanian ethnicity, since 1913 when they chose the Greek nationality and not the Turkish one. When they were expelled, in 1944, the citizenship of 1,930 Cham Albanians was removed after they were sentenced to death as collaborators. The rest, which formed the majority lost their citizenship, under a special law of 1947. Orthodox Chams remained in Greece and retained the Greek citizenship, but without any minority rights. The evicts were organized as refugees in Albania, under the authority of the National Anti-Fascist Cham Committee, until 1953. At that year the Albanian government disbanded the committee and granted forcefully the Albanian citizenship to the Chams. In Turkey and the United States, Cham Albanians got the Turkish and American citizenship. Cham Albanians claim the returning of the Greek citizenship, as a first phase in order to resolve the Cham issue. They are reported not to have as a primary issue the regaining of the properties, but the citizenship, because this is seen by Chams as an excuse for their suffering. They argue that the remove of their citizenship was a collective punishment, when even the Greek courts have charged only a minority of Chams for alleged crimes. They have asked the Greek government to have a dual citizenship, a policy followed by Greece in the case of the Greek minority in Albania. On the other hand, Greece says that the Cham issue is a closed chapter in the relations between Greece and Albania, and as such, does not accept this claim. The Alienation of Muslim Chams property did not start at the end of World War II when they were expelled. There were four different laws, from 1923 to 1937, that alienated the properties of the Muslim Cham Albanians, as a stipulation of the Convention Concerning the Exchange of Greek and Turkish Populations. 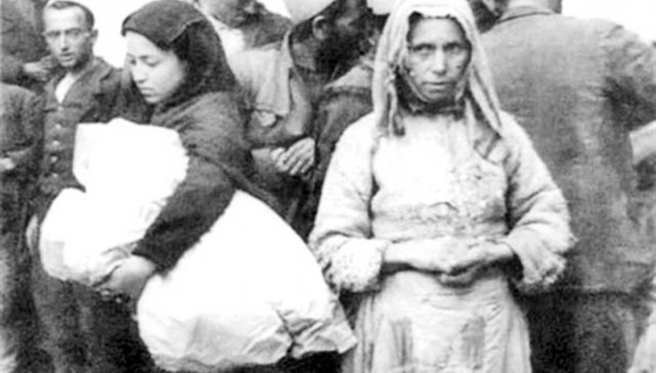 Respectively, the immobile property of Greeks evacuating Asia Minor was allienated by Turkey and given to Muslims from Greece. However, the Greek refugees who came from Asia Minor were three times more than the Muslim refugees who left Greece. Following these events, the Greek policy was that properties belonging to either Muslim citizens in Greece, who were exempt from the exchange of populations, or to foreign citizens to be taken. The first law was passed on 15 February 1923, which alienated the lands and second homes of Muslim Cham Albanians, in order to give it to Greek settlers for Asia Minor and to Greek farmers, that had no land. After this law, Muslim Cham Albanians tried to regain their properties, under the Greek Law of 1926, which gave them the opportunity to bring to courts this confiscation. Under these circumstances, Greece passed two laws, in 1930 and 1931, which gave bigger compensations to the Muslim community. But, both of them were executed very limited, because of the change of the Greek government. The final law that nationalized the whole properties of Muslim Cham Albanians and other Albanian nationals in Greece was passed in 1937. This law confiscated all properties of Albanians in Greece and the compensation that it provided were delayed, something which was seen as a provocation. After World War II, Cham Albanian's properties were put under escrow, by the Greek state. In 1953, the Greek parliament passed a law, that considered as "abandoned" the rural immovable properties, whose owner had left Greece without permission or passport.After three years the properties were nationalized. While homes were nationalized in 1959, when a law passed by the Greek parliament considered them abandoned and allowed their conquest by other inhabitants of the region. These two laws nationalized Chams properties, and allowed others to settle in their homes, but the ownership was under the Greek state. Under these laws, a number of other inhabitants of Epirus settled in Chameria, especially, Vlachs. The homes and properties of Chams came under their administration, but the new inhabitants did not have neither the legal ownership, nor the right to sell or buy other properties of Chams. In the decades of '60s and '70s an ad hoc commission for the property alienation in Thesprotia gave by draw the rural properties to farmers with and without land, while homes and urban properties in Igoumenitsa, Paramithia, Margariti,Filiates, Perdika and Sybota were given to homeless people. Another problem in the Cham issue is the minority status. Cham Albanians not only demand their repatriation and minority rights, but they have asked minority rights even for Orthodox Chams residing in Greece. This position is supported even by politicians in Albania. In January 2000, Sali Berisha, then head of the opposition demanded more rights for the Cham minority in Greece, which includes cultural rights for Albanians living in Greece, such as the opening of an Albanian-language school in the town of Filiates. In 2005, a diplomatic incident occurred, when the President of Greece, Karolos Papoulias canceled his planned-meeting with Albanian homologue, Alfred Moisiu, in Saranda, because 200 Cham Albanians, were demonstrating for the Cham Issue. The Greek Ministry of Foreign Affairs stated that the Albanian authorities did not take adequate measures in order to protect the Greek President "by deterring known extremist elements, who are trying to hinder the smooth development of Greek-Albanian relations". Albanian president's office stated that President Moisiu expressed deep sorrow at this unexplainable decision, which was based upon misinformation, of the "small, peaceful and well monitored demonstration". ​Liberation Army of Chameria (Albanian: Ushtria Çlirimtare e Çamërisë) is a reported paramilitary formation in the northern Greek region of Epirus. The organisation is reportedly linked to the Kosovo Liberation Army and the National Liberation Army, both ethnic Albanian paramilitary organisations in Serbia and the Republic of Macedonia respectively. In 2001 the Greek police reported that the group consisted of approximately 30-40 Albanians. It has not the official support of the Albanian government. Fabbe, Kristin. "Defining Minorities and Identities—Religious Categorization and State-Making Strategies in Greece and Turkey". Presentation at: The Graduate Student Pre-Conference in Turkish and Turkic Studies, University of Washington, October 18, 2007. Albania at War, 1939-1945. Retrieved 14 May 2015. Vickers, Miranda. The Cham Issue—Where to Now? Paper prepared for the British MoD, Defence Academy, 2002. The new Albanian migration. Russell King, Nicola Mai, Stephanie Schwandner-Sievers. Sussex Academic Press, 2005. ISBN 1-903900-78-6. Page 71. Population exchange between Greece and Turkey. Wikipedia article. "HELLENIC INSTITUTE OF STRATEGIC STUDIES". Retrieved 14 May 2015. "ΔΙΕΘΝΗ - ΡΙΖΟΣΠΑΣΤΗΣ". Retrieved 14 May 2015. "Αντίβαρο - Αλβανικός Εθνικισμός: Μύθος ή πραγματικότητα;". Retrieved 14 May 2015. George Bourazanas - GBA web developing. "Μετά το Κόσοβο, η Τσαμουριά;". Retrieved 14 May 2015. "Macedonian Press Agency: News in English, 2001-05-31". Retrieved 14 May 2015. Sadiku, Blerina Namik. Lindja e çështjes çame 1820-1943. Naimi, 2011.